Minister of Tourism, Economic Development, Investment and Energy the Hon. Asot A. Michael convened the first leadership meeting of 2017 with all department heads and senior technical officers within his Ministry. The focus and tasks in all priority areas have been outlined and as such each department head has a clear understanding of their outlook for the year ahead. In outlining the key priority areas for 2017, special mention was made of new appointments within the Ministry. Senator Arthur Thomas QC has been appointed as the new Chairman of the Antigua and Barbuda National Parks Authority, while Ambassador Bernard Percival has been appointed to serve as Chairman of the St. John’s Development Corporation. Priority focus has been set on securing growth in all major source markets for 2017 by 10%. A major effort will be pursued to increase airlift from existing markets, UK, Italy, USA and Canada. New Airlines to be targeted this year include Jet Blue, Spirit and South West from Fort Lauderdale in addition to Copa, Emirates and Norwegian. Work at the Ministry headquarters will focus around the development of activities surrounding the branding of 2017 as the year of Sustainable Tourism by UN World Tourism Organisation UNWTO as well as a thrust to continue to increase the involvement of the indigenous population (small properties) in the ownership, management, and operation of tourism facilities and events. A concerted effort to engage the local population on the importance of the industry must be made in 2017 and according to Minister Michael this should encompass three spheres; “a local PR campaign which should highlight the achievements made in Tourism with testimonials from our own people as to the value of the industry, a rollout of revised Tourism Channel content video for showcasing the product to visitors and locals and the continuation of the Tourism Cadet Corp program with a new batch of secondary school students to expose them to the industry”. The road to a new St. John’s has been envisioned and initial phase of this will be a signage and beautification campaign to enhance to beauty of the City of St, John’s and its environs. Funding for this project has already been approved by the Cabinet of Antigua and Barbuda. In the areas of yachting and National Parks, a very passionate Tourism Minister urged his team to build upon and leverage PR for Nelson’s Dockyard being named as newest World Heritage site in all yachting marketing and to seek out new and additional sponsorship for the World Renowned Antigua Sailing Week and to ensure additional events and activities for this year’s 50th Anniversary. Marketers were also admonished to utilize the newly renovated Clarence House which is the best preserved example of a Georgian Colonial Great house in the entire Caribbean, for major events as well as establish the Commonwealth Walkways by implementing Phase 2. Sir Rodney Williams officially launched phase 1 last year. It utilizes the 10 km of nature and historical hiking trails throughout the National Park. Major developments are expected to continue to take place with regards to the continued improvement of the infrastructure at the island’s ports. The next phase of the US$60M St. John’s Master plan has started and will be ready for the Oasis class ships by November 2017. The St. John’s Development Corporation (SJDC) will spearhead this project along with the Antigua Pier Group and the Antigua and Barbuda Port Authority. In addition to this the SJDC is also tasked with the responsibility of overseeing the Fort James Project. This project will be fast tracked under the control of the corporation. Nationals will be included to empower them to be major stakeholders of our tourism trade. Upon completion Fort James will be converted to a multi-use richly diversified recreation and entertainment tourist attraction. The Hon. Minister of Tourism stated that his government will continue the aggressive ground breaking of new hotel properties in 2017 and will strategically seek out viable investments to add to the room stock of the twin island state. In this vein, Minister Michael urged the heads of the Antigua and Barbuda Investment Authority to compile and produce a comprehensive investment guide of Antigua and Barbuda. According to the Investment Minister this comprehensive document which can also be produced in a digital format will be valuable to not only himself but his cabinet colleagues when they travel abroad to numerous tradeshows to attract investors to our shores. 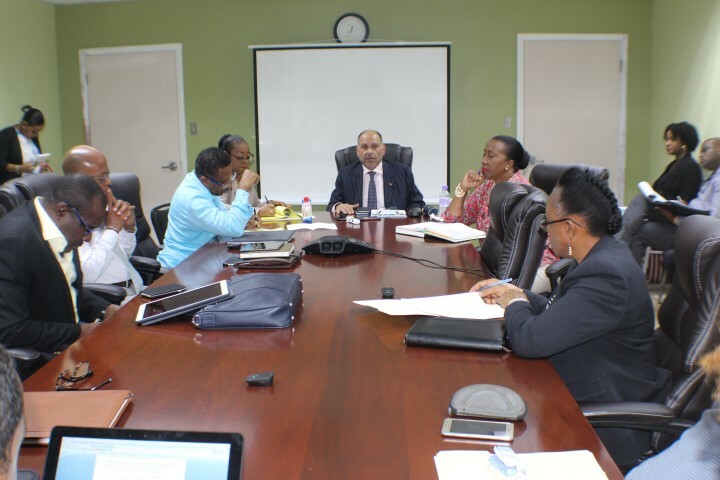 In addition to plans to complete the addition of a total of 10 MW of renewable energy to the grid in Antigua and Barbuda in 2017, the establishment of a national energy council is primary amongst the objectives of the Ministry of Energy. Minister Michael who holds the portfolio expects that not only will the council be established but the first meeting which should comprise a limited number of key energy stakeholders in the public and private sector should be convened with the aim of fostering coordination in the energy sector and of providing high level policy input to the Ministry of Energy. The Hon. Minister urged his team members to be creative and innovative in their quest to rise above the bar of standard expectations…only so will the destination surpass the successes of 2016.